The long wait is over! It’s time! Two more days before the much awaited fight of the century: The Pacquiao vs. Mayweather 'Battle for Greatness' match on Saturday, May 2nd (Sunday May 3rd, Manila Time) at MGM Grand Hotel in Las Vegas, Nevada, USA. As early as January this year, boxing pundits share their thoughts on this once in a lifetime event. Experts gave their predictions on who will be the last man standing after 12 nail-biting rounds. It is pretty obvious that Pretty Boy Floyd is the front runner with his immaculate 47-0 record compared to underdog-Pacquiao’s 57-5. The big Q now: Can Pacquiao pull-off a W? Let’s take it by the stats. Both fighters are not getting any younger. Let’s admit it, both fighters are almost past their primes. Even though Mayweather retains his unblemished record, his age will still be a factor in this bout. 2 years age gap is not a big deal but somehow will have an effect when it comes to stamina and energy. “Money” has not faced any fighter as quick as Manny in the ring and he is not as fast as Pacquiao. Mayweather is fully aware of his age and speed disadvantages. These are the main reasons why he spent more time on his cardio by jogging, swimming and axing woods. There’s a saying that: “Experience is the best teacher.” Speaking of experience, The Fighting Congressman from Philippines is the more experienced boxer over Mayweather. Manny has 17 more fights than Mayweather and he has faced all types of pugilist on the canvass. He has faced bigger and taller boxers like Oscar Dela Hoya, Miguel Cotto and Shane Mosley whom he all demolished or knocked down at least. Oh yes, Mayweather has also fought these guys. He won over them too! But, via Unanimous Decisions only. It only shows that Pacquiao is capable of knocking out taller and bigger guys. This leads to the next focal point: height and reach advantage. The undefeated American is 2-inch taller and has 5-inch longer reach than the Filipino Southpaw. No one argues on this one. Clearly, Floyd has this advantage. If both of them simultaneously throw a jab or straight, scientifically speaking Pretty Boy will surely connect. Given that Floyd connects a jab or a straight to Manny, will it generate enough power to deck Pacquiao? My hunch will be NO. Mayweather’s punching power is not enough to send Pacquiao kissing the canvass. Sugar Shane Mosley and Ricky Hatton gave their take on who among the two protagonists hit harder based on their actual experience in the ring. "Having felt both guys punch, Pacquiao is the harder puncher because I went down. I was dizzy when I got up. I felt in that fight I didn't have a chin anymore," Mosley, who lost to Pacquiao in 2011, told ESPN.com. "First thing I noticed about Manny was his speed like in the Floyd fight. But he was heavy-handed, a lot more heavy-handed than Floyd. He punches were more explosive. Floyd is more calculated. Manny clipped me with a lead right hook and even the non-power punches felt very, very heavy-handed," said Hatton. It these live testimonies do not convince you, take a look on their knockout records. Manny’s 38 KOs compared to “Money’s” 26, do the math and tell who hits harder. Pacquiao has a dozen KO’s more than Floyd. The 5’6” guy has not knocked out somebody for years now! So there’s no way he can put “Money” to sleep. Since Pacquiao has moved-up to the Welterweight Division, he has not recorded any KO. We may not expect any KO from either of the boxers. This bout will go to the distance. But here’s my fearless prediction, Pacquiao will outscore Mayweather and will win this one via Unanimous Decision it is simply because “Speed kills.” This will be the first time that Floyd will face a lightning quick and lefty boxer. "He's hard to read. He shuffles fast with his feet, moves in and out and has no real rhythm. That's gonna be a massive problem for Floyd because Manny's footwork is great," said Hatton of Pacquiao. Mosley pointed to Pacquiao's lefty stance as a potential problem for Mayweather. "Floyd has had a problem with southpaws before," he said. "Mayweather likes to lean over to his right side and Pacquiao likes to throw the left hand down the pipe and maybe that happens. He has a great straight left hand." 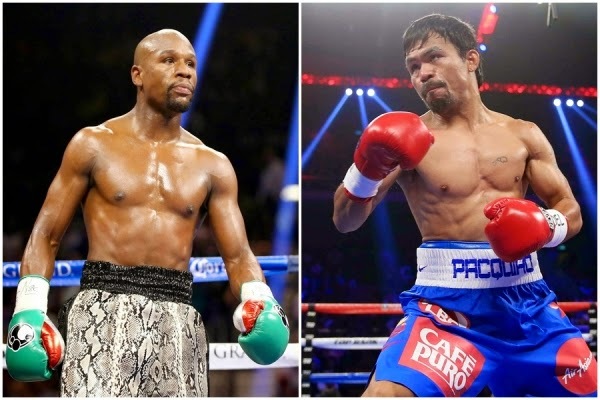 Mayweather would not be able to handle the volume of punches that Pacquiao will throw at him. He will be on a defensive mode all throughout the bout and will wait for Manny to be careless so he can counter and score another “ala-Marquez” or in-short: “lucky punch” that can put Pacquiao to sleep. But the thing is, Manny has learned from that fight. Experience is the best teacher as we said. Look at Manny’s last three fights against Timothy Bradley, Brandon Rios and Chris Algieri. He schooled these guys with his speed and barrage of punches. He even decked Algieri six times, so tell me now if Pacquiao still does not have any chance of winning? Will the venue, assigned referee and judges will be a factor considering MGM – Las Vegas is a Mayweather country? As a real sport fanatic, I seriously do not think that these things will be issues for Manny Pacquiao.